Sure, we love our FurKids, but some ‘treats’ aren’t a treat at all. Having a dog is a pleasure beyond compare! They greet you when you get home. They’re always happy to see you—unlike surly teenagers! They will cuddle you when you’re sad… They’re awesome! So as a gesture of love, many people think that they are expressing love back when they give their dogs special human food treats. After all, the way to a dog’s heart is through it’s stomach. Oh wait, that’s a man. Anyway… The POINT is that treats and certain foods aren’t always good for our four legged friends; some can be downright dangerous. Part of the reason this happens is that dogs metabolize foods differently than humans and even other animals do. Their bodies break down the food at a different rate and that’s how some foods can become toxic to them, yet not affect us in the least. 1. Chocolate— This is a well known one, but bears repeating as every year, veterinarians face cases of dogs who have been poisoned by ingesting chocolate. Chocolate contains a chemical compound that humans metabolize quickly but dogs don’t: theobromine. It builds up to toxic levels in dogs and is similar to caffeine in terms of its effects: it can cause diarrhea, vomiting, cause cardiac issues including irregular heartbeat and even a heart attack. If you suspect that your dog has ingested chocolate by accident, get to a vet or vet emergency clinic right away! 2. Corn on the Cob— The corn isn’t so much the issue here, although too much of that can upset their digestive systems. Really, the issue is the cob. If a dog ingests a cob, it will most likely block their small intestine and have to be removed surgically, as they are unlikely to ‘pass’ it. 3. Grapes and Raisins— While the ingredient in grapes (and their dried counterparts) that causes toxicity in dogs has yet to be identified, it is well documented that grapes, in sufficient quantities, can cause acute kidney failure. The quantity would obviously depend on the size of the dog so it’s best to keep your dog away from this fruit in particular. 4. Onions and Garlic— All types, including chives, contain a compound called N-propyl disulfide that can contribute to anemia and red blood cell damage in dogs (cats too!) by damaging the hemoglobin, the substance that carries oxygen to cells. Avoid giving them human foods that contain onion or garlic, including dried or powdered varieties. 5. Xylitol— This sugar substitute is found in many things including gum, candy, and is sometimes used in ‘no sugar’ options of cakes and breads. This ingredient, even in a small quantity, can cause seizures, liver failure, hypoglycemia and, in sufficient quantities, death. This is definitely not something you want to mess with, around your dogs. Alcohol – no drinks for doggo at New Year’s, okay? Bones – specifically cooked bones, which can splinter and get caught in the dog’s throat. Cat food – these formulations have different levels of protein and fat and would upset a dog’s digestion. Luckily, most dogs don’t care for it. Milk and dairy products – dogs are lactose intolerant, so like a human with the same problem, consuming dairy will make them at best flatulent, and at worst give them diarrhea. Any spice that contains capsaicin – chili powder and paprika, for example. Dogs are best fed a natural raw food diet as directed by a vet, or commercially prepared foods with natural ingredients. While we humans might think it is the height of loyalty and love to share some human food treats with our pets, you could be doing them a fair bit of harm and not know it! 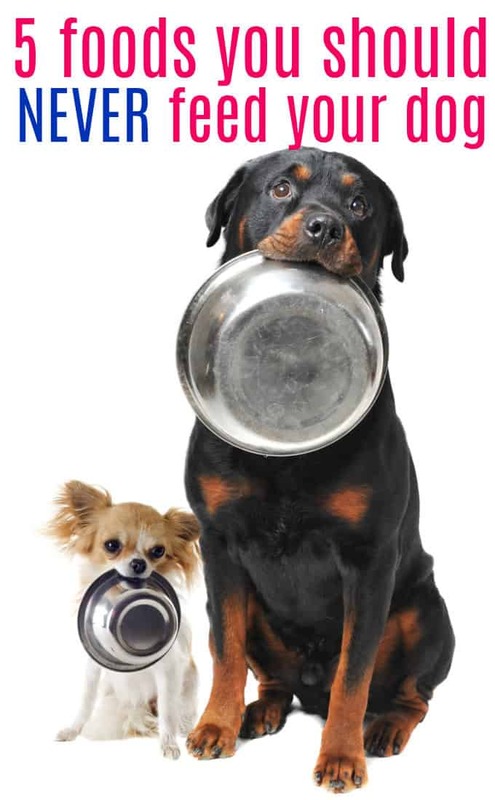 What do you feed your dog on a daily basis? Do they like it or are they picky eaters? My dog is a picky eater. This is a good list of items to avoid and make sure that I keep these items away from my dog. Bones are so dangerous because they can get lodged in the neck. No dogs in our house at this time. I didn’t know dogs were lactose intolerant. I will keep that in mind when it comes time to get a new puppy. It is important to keep your dog healthy, so these are great tips. Thanks for letting me know!! I will make sure I don’t feed them that. I think I knew all but the corn on the cob (although my dogs never had corn in their diet at all, so…) But it sure makes you wonder if xylitol is something even humans should ingest, doesn’t it! Great post. Thanks for sharing! I had no idea about most of these. I have cats, do you know if the list is the same for cats? Definitely important for dog owners to know, we definitely make sure we avoid all of these. Our girls love their carrots, peas, green beans, sweet potatoes, apples & bananas. Thanks for the information,this is good to know to keep our pets safe. Thanks for this article. I didn’t know about garlic. Well, all I can say is that it’s a jolly good job that I don’t have any dogs, the only one of this list I knew was the bones one. Our three dogs love milk and there has never been any problems with them drinking milk. They are all very healthy. My dog will eat almost anything I give him. The only two things I have found so far that he refuses to eat are kale and spinach. I didn’t know you shouldn’t feed your dog corn on the cob, although I knew about the rest! Thanks for the enlightenment! Our dog never got people food. A friend’s dog likes grapes, but never more than one or two. These are great tips and I know about most except the sugar substitute and I plan this information on my FB page! I don’t have a dog, but I do have a pet friendly office so I have “adopted” dogs. I will print this off and post it in the communal rooms for the other peeps at work. People are always giving treats and other items to office dogs. I don’t give my dog any of those things, but it’s still good to know. Love this post. Always good to highlight these foods for pet owners. Good to know and always a good reminder with kids around! Wow, I didn’t know about the garlic and lactose intolerance. Thanks for sharing! Always a great reminder to folks with pets. I didn’t know about the onions and garlic. Thanks. Keep pets safe, this is a great list of no nos to feed dogs. Thanks for sharing.